10" overall. 4 7/8" black textured powder coated 1095 carbon steel blade with thumb ridge. Full tang. Canvas Micarta handles feature a divot that can be used as the socket for the fire bow drill method. Stored inside handle is a Ferro rod and tinder tabs. Lanyard hole. Black molded sheath with clip plate and OD green nylon lanyard and boot clip. 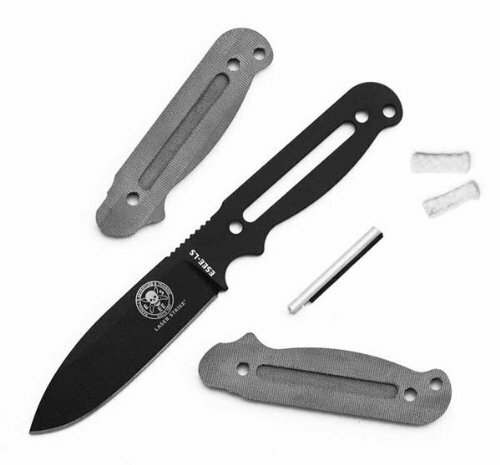 Also includes an ESEE survival card. Bulk packed.